Tiki pendant necklaces bring a dash of style. If you're looking for a way to show off some tropical style, a tiki necklace could be the perfect item for your jewelry box. This surprisingly versatile jewelry item will make you smile, whether you're on a tropical island or just going about your day. Tiki necklace designs come in a variety of styles and can be made from many different materials. Generally, these charms feature Polynesian tribal designs. 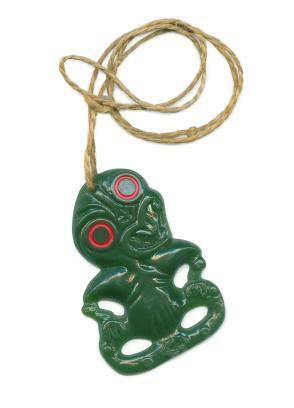 In Maori myth, the word "tiki" refers to the first man ever created, and tiki jewelry often features an image of a primitive human. Both men and women commonly wear tiki necklaces, which have a simple, unisex appearance. These necklaces are very popular with people from New Zealand, since they are closely linked with Maori culture and New Zealand's history. Going to a luau? Polynesian jewelry is a great way to express a tropical style, and it's a lot more subtle than a loud, Hawaiian-print shirt. Heading out to a concert or casual night on the town? A tiki necklace can be the perfect accessory, since it shows off a laid-back, natural style. Need something to wear on vacation? If you pair tiki jewelry with a t-shirt or other casual wear, you'll have an instant island appearance. Tiki jewelry is surprising easy to find. Whether you want a simple pendant or an elaborate string of beads, you'll find the perfect tiki necklace for you. If you're visiting the islands, tribal jewelry might be a wonderful souvenir. You'll wear this useful accessory all the time, and it will serve as a reminder of your vacation. Tiki jewelry also makes a great gift for friends at home. When you're on vacation in a tropical place, you can usually find tiki jewelry at local artisan shops, souvenir stands, and museum gift stores. Making your own tiki necklace is simple, and it's a great way to express your creativity. Creating your own necklace also lets you match the jewelry to your wardrobe. Most bead shops carry tiki-style charms. These charms are usually inexpensive and come in a variety of materials. To make your necklace, simply choose a tiki charm and select matching beads. The attendant at the bead store will help you figure out a great clasp. You can also make a very simple version of this necklace by stringing a tiki charm on a plain leather cord. Tiki jewelry has many advantages. Because this style of jewelry is rarely made from costly materials, it is usually very inexpensive. You can collect many tiki pieces, and you may even decide to wear several at once for a layered look. The fun, playful attitude of tiki necklaces will put a little extra spring in your step, even if you're far away from the tropical isles.